Both products are tightly integrated with Excel. From a user standpoint, they are working in Excel. But BI360 has a little more separation behind-the-scenes. With BI360, you have the additional advantage of being able to do some design before regular Excel comes into play. It’s like having a “pre-Excel” calculation engine. BizInsight leverages regular Excel functionality, like formulas. BI360 allows you to use all the regular Excel functionality too. But there is a little more separation behind-the-scenes between Excel and BI360 which allows for more functionality on top of the regular Excel funtionality. This behind-the-scenes separation also allows you to do things like dynamically explode rows, columns, and worksheets based on data fields. For example, you can drop warehouse in a cell, then drop vendor two cells to the right. When BI360 runs the report, it can explode the list of warehouses into columns, then go two cells to the right and explode the list of vendors into columns. You can do the same thing with exploding rows and exploding worksheets. Excel pivot tables can’t even do this because you will get an error when the first pivot table tries to overlap the second pivot table. This can only be accomplished when you have a “pre-Excel” calculation engine that kicks in before things are handed off to regular Excel. Of course, you can still add in all the regular Excel stuff like formulas, pivot tables, charts, conditional formatting, etc. 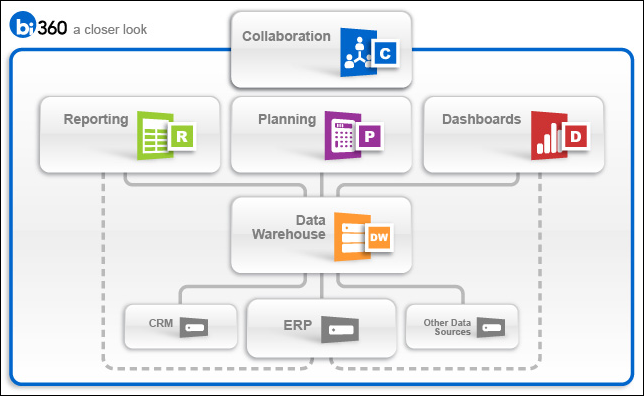 into a BI360 report, just like you can with BizInsight. The Excel separation also provides the benefit of simpler and more powerful filtering. BizInsight filtering is based on parameters passed to Excel formulas. You have to go into each cell formula to see which filter is getting applied there. 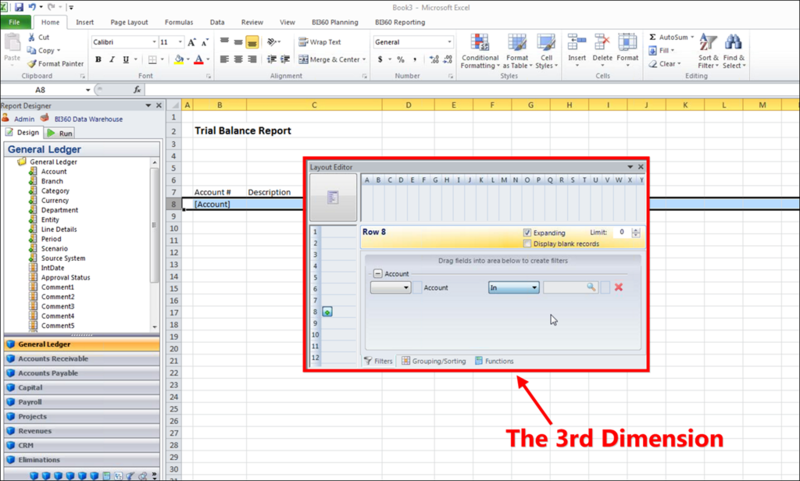 With BI360, the filtering is done in a window that sits on top of the spreadsheet. This “3rd Dimension” makes it much easier to visualize what filters are getting applied to groups of rows, columns, and worksheets. Lastly, the Excel separation in BI360 also makes for a nicer end-user experience. When a user fills in the parameters that were defined for a report, they do it in an area that is physically separate from the spreadsheet. It’s still in Excel, but the parameters have their own pane which makes things very clean and very clear to the user. BizInsight relies on the user to enter the parameter values in regular spreadsheet cells. You can make all those cells a separate color (or something like that) to make them stand out, but I like the way BI360 makes them stand out even more by presenting them separately without you having to do any special formatting. If you know much about analytical reporting, then you are probably familiar with Facts and Dimensions. Fact data is your transactional record data like sales order lines, inventory transactions, customer billing information, etc. Dimension data is your master record data like customer name, customer location, customer category, etc. You typically perform calculations over the Facts. Then you “slice and dice” over the Dimensions. The team that built BI360 came from a data warehousing / OLAP background. So it’s no surprise that BI360 is stronger than BizInsight when it comes to Dimensions. 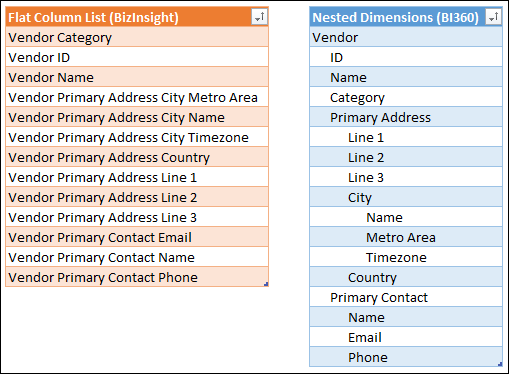 BI360 allows you to group your columns by dimensions and even nest dimensions whereas BizInsight gives you more of a “flat” list of columns. The first problem with a “flat” list of columns is that you have to manually manage the dimensions. When designing an enterprise reporting solution, you are creating many different data sets composed of fact data. Let’s take two fact tables as an example: Sales Order Lines and Inventory Transactions. Both Sales Order Lines and Inventory Transactions can have a part number or item associated with them. Item is a dimension with a whole set of columns associated with it like Item Description, Item Type, Item Purchase Unit of Measure, Item Standard Cost, etc. When you have the ability to build an item dimension, all you need to do is attach the item dimension to both Sales Order Lines and Inventory Transactions, then you’re done. Without dimensions, you have manually add all those item columns in both places. The real headache comes (as I’ve experienced) when six months later you add another item column to Sales Order Lines, but forget to add it to Inventory Transactions. This kind of inconsistency confuses users and requires a lot of manual effort to keep things in sync. The second problem with a “flat” list of columns is when you have lots of columns. At my company, we frequently have over 100 columns associated with a data set and it can be a real pain to find the one that you’re looking for. Beginning related columns with the same prefix (like with our item columns above) helps things to get sorted in groups, but the groups stand out better when there is a true dimensional concept introduced. Nested dimensions allow you to put a group of columns inside another group of columns to make it even easier to find the column that you’re looking for. Perhaps the best way to illustrate the benefit of dimensions and nested dimensions is with a graphic. Note: I made this graphic quickly using an Excel spreadsheet so you don’t see the plus signs on each indented level that you would see in BI360 which allow you to expand/collapse the group. Collapsing groups makes it easier to eliminate noise when you’re sifting through a lot of columns to find the one that you’re looking for. BI360 has its own separate row security feature except it isn’t limited to specific entities like row security in Acumatica. You can apply row security to pretty much anything. That way you can control which specific customers, vendors, warehouses, etc. that a user has access to. In the example above about exploding columns, each user would only see the warehouses and vendors that they have access to. This allows you to design one report that will look different for each user depending on what they have access to. BI360 has a whole suite of modules, not just a reporting product. In this post, I only talked about BI360 Reporting because that’s the piece that is comparable to BizInsight. However, there are other modules available too. Click the image below to read more about each one. Solver recently introduced a web-based reporting module. THIS IS HUGE. The biggest drawback to designing reports in Excel is that a report user has to have Excel installed on their computer to use it. Usually this isn’t a big deal, but it’s much cleaner to send someone a hyperlink to a web-based report rather than attach an Excel file to an email. This is especially crucial if that person will be looking at the report on their phone, iPad, or similar device where Excel isn’t available. The web-based reporting product allows you to save your Excel files into the web portal. Then users can run them using only their browser. Microsoft did something similar to this with their Power BI offering, but you have to pay per user. 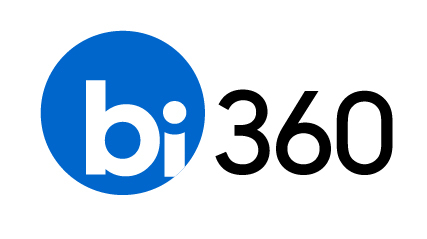 With BI360 web-based reporting, you pay a one-time fee and all of your current BI360 users automatically get access to run the reports in the browser. It’s the best of both worlds: power users can design reports using Excel and report users can run reports in the browser. This is very slick! This is all just based on my personal observations of course and is not meant to be a comprehensive evaluation. But, since I did go through the process already, I thought I’d share my take on things. BizNet is headquartered in Dallas, TX while Solver is headquartered in Los Angeles, CA. Not that it matters, but it’s interesting to note. Aesthetically, the BI360 product looks and feels more modern, just like Acumatica.